Dear friends, it passed almost one week since I left Hong Kong and started my journey on board MV Santa Brunella sailing to beautiful and hot Indonesia. On the vessel I met very funny and nice people which are taking good care of me. 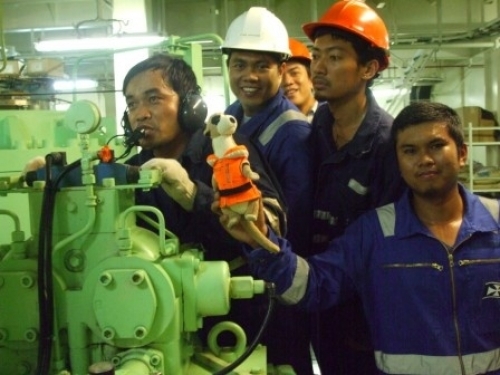 During these first days I took part in ship trainings which help us react fast in case of emergency. I even took some pictures in case you don’t believe me. Here you can see me together with a part of the crew just before man overboard drill. And here A/B Alvarico Oliver is showing me how a proper emergency steering must be done. 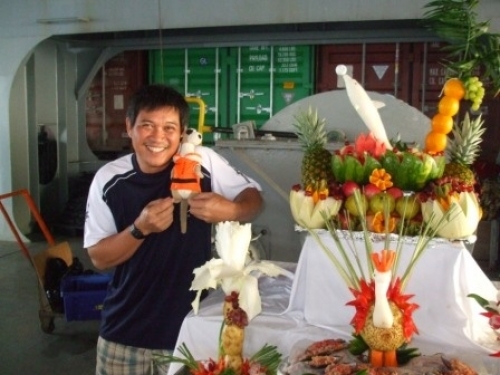 For sure you noticed at my back a man with a big smile, his 2nd Mate Aguinaldo John, a good friend of mine. But enough with work, let’s see some photos from barbecue partyyyy. 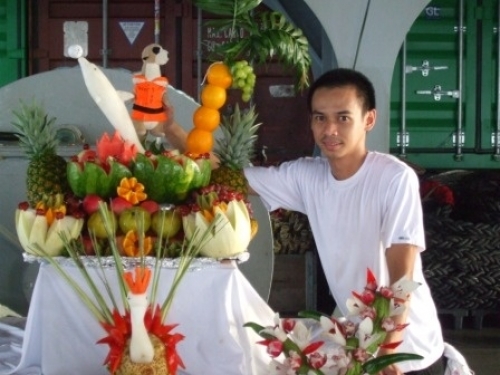 In this picture I was presenting, together with Mr. Abad, a masterpiece done only from fruits by our Chief Cook. And here I’m together with one big fan of mine and a very good dancer, Mr. Satur Hugo, the fitter of Santa Brunella. I hoped you enjoyed the photos as much I did. Stay close for more news from my trip to Indonesia.